Little Miss and I recently visited Nutcote, the beautiful house and gardens of May Gibbs in Sydney's Neutral Bay. May Gibbs (1877-1969) is one of Australia’s foremost children’s author and illustrator and best known today for her iconic story The Complete Adventures of Snugglepot & Cuddlepie. Nutcote is now a house museum surrounded by an English garden and Australian garden which is opened to the public all year round and run by volunteers. May Gibbs lived at Nutcote for 44 years until she passed away and donated the property to Unicef who were not able to hold it and was later sold to a developer whose intention was to demolish the site. After years of 'Save Nutcote for the Nation' campaign, the house was placed on the Register of the National Estate. North Sydney Council years later bought Nutcote for $2.86m in 1990, it was then restored to show the house as it would have looked in the late 1920s and early 1930s and then was opened to the public in 1994. It was lovely walking among the beautiful gardens and imagining May Gibbs living there, such a calming place to visit. Try to stop the large caterpillar in the garden, very cute. Before attending one of the guided tours, we walked to the back of the house, around the Australian garden and admired the perfect view! At the back of the house, we spotted the statue of the Big Bad Banksia Man with Mr Lizard trying to save a gumnut baby. We spent some time on the bottom level of the house, watching a video on May Gibbs and Nutcote, looking at cute gumnut babies, colouring in, reading books, playing dress-ups (before and after the tour) and taking photos behind the gumnut babies' screen. Kids can dress up as the Big Bad Banksia man, Ragged Blossom or a Gumnut baby and yes - we did tidy up after little Miss' multiple dress-ups ha! We then headed to the guided tour, where a kind volunteer showed us around May Gibb's beautiful house built in 1925. The restored house was just lovely and it was interesting to listen to stories of May Gibbs and her husband, about the house and how May Gibbs left everything she had to children focused charities as she loved children but was never able to have her own. Our tour guide so sweet and made sure that little Miss and another little girl visiting were both included in the visit by showing different things around the house like an old typewriter, old record player, old telephone and a big Banksia that inspired May Gibbs' character the Big Bad Banksia Man. May Gibbs' gorgeous drawings, stories and characters are showcased throughout the house and true fans will love reading up on these special pieces. 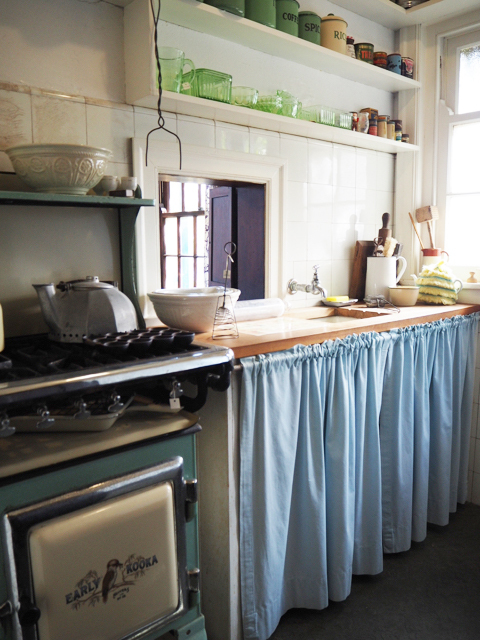 One of my favourite rooms in the house would have to be the restored kitchen - how stunning! After a very interesting tour, we walked around the English garden where we found the Bib & Bub Gumnut Babies. We also enjoyed a warm cup of hot chocolate and some delicious homemade biscuits at the Bib & Bub Tea Rooms overlooking the garden and the house. Little Miss was also happy playing some garden games. And visited the Nutcote gift shop before we left, so much cuteness to choose from! We really enjoyed our visit at Nutcote and will be sure to visit again with family and friends. I know my mum would love to visit May Gibbs' beautiful house and gardens! Nutcote is such a gorgeous place and is great for parents and carers to bring children along. We saw many grandparents with their little ones visiting Nutcote during the holidays. If you are thinking of experiencing Vivid this year, Vivid Sydney are having a special 100th anniversary show of Snugglepot and Cuddlepie with May Gibb's colours and characters at Customs House near Circular Quay. Renowned art and animation collective Ample Projects brings May Gibbs’ immortal characters to life on the façade of Sydney’s 1845 Customs House. Visitors can join Snugglepot and Cuddlepie and their stalwart companions on their journey through the Australian Bush as they encounter the weird, the wonderful — and things quite unknown altogether. On from Friday 25th May to Saturday 16th of June from 6pm to 11pm for free at Customs House. May Gibb's Nutcote is open Wednesday to Sunday from 11:00am to 3:00pm (Closed Mondays & Tuesdays). 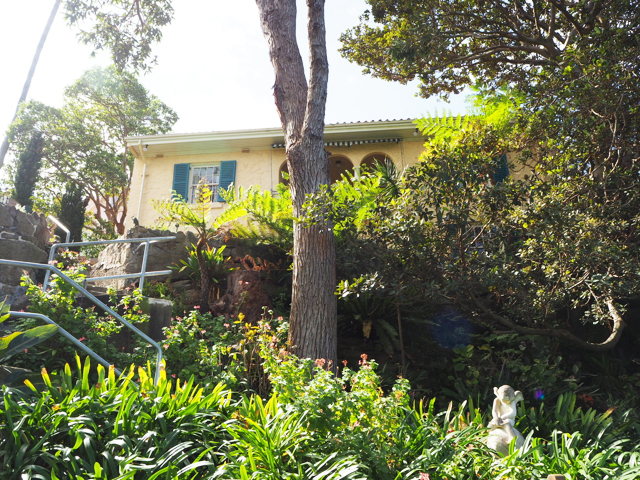 The garden is located at 5 Wallaringa Avenue in Neutral Bay. Entry fees are as follows: Adults: $10, Concessions: $6, Children: $4 (Age 5 and over) and Family: $20 (2 adults and up to 2 children aged between 5-16 years). Leave the pram in the car or at the gift shop and take bub in the carrier as there are many stairs (stairs from gift shop to the tea rooms down to the garden and stairs down to the back of the house and Australian garden). Accessible toilets and a baby change toilets are available onsite. There is limited parking onsite however we were lucky to find a park close to Nutcote. There are regular guided tours, you can check with the gift shop for times or head to May Gibbs' house where time will be indicated. Busy City Kids were invited to May Gibb's Nutcote in Neutral Bay for the purposes of a review. All opinions & feedback are genuine & truthful. Travel and fee paying activities were self funded. For more information on May Gibb's Nutcote in Neutral Bay, head to their website.